The standard SharePoint Online external sharing features can be used to create a business-to-business (B2B) extranet collaboration site. There are several complimentary SharePoint Online sharing features that make SharePoint Online a great place to have simple, highly secure, and connected partners engagements. If you're also using SharePoint Server 2013 or SharePoint Server 2016, we highly recommend reviewing the available SharePoint hybrid features to integrate SharePoint Server with Office 365. Choose the invitation model that works best for you. Decide if your partners users will need SharePoint Online licenses based on what features they'll need access to. Create a lifecycle plan for your guest users and what to do with the content and users accounts when you complete the collaboration for which you're creating the site. When you complete this article, read Securing a SharePoint Online extranet site. User-initiated guest invitation model - This is the default for a new site collection and the recommended model as it provides control to administrators and at the same time flexibility of end users being able to collaborate with their new business partner users without much intervention. Site-owner-initiated guest invitation model - If you want more control than the default sharing model over who can invite new users to a site, you can configure the site to only allow site owners to invite new users. This prevents ad-hoc invitations from being sent out by site users. Admin-managed partner users model - In an admin-managed partner users model, the Office 365 you pre-populate your organization's directory with the guest users who you'll be inviting to your site. This can be done by importing users from other Office 365 or Azure AD. See Securing a SharePoint Online extranet site for details on how these options relate to site sharing and which settings to choose. Guest user accounts have limited capabilities in SharePoint Online. See Manage external sharing for your SharePoint Online environment for details on those features and what additional capabilities can be provided. If you determine that your partner users need additional functionality, such as the ability to create team sites, you can assign SharePoint Online licenses to these user accounts. Assigning an Exchange Online license to guest partner users is not supported. 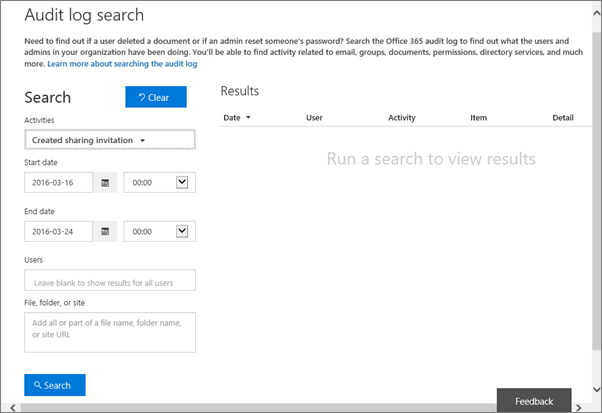 The Office 365 activity report in the Office 365 Compliance Center is used to view Office 365 user and admin activity within your company. The report can be filtered by date and user activity events to monitor SharePoint Online extranet invitation status, who has sent invitations, and who has accepted. 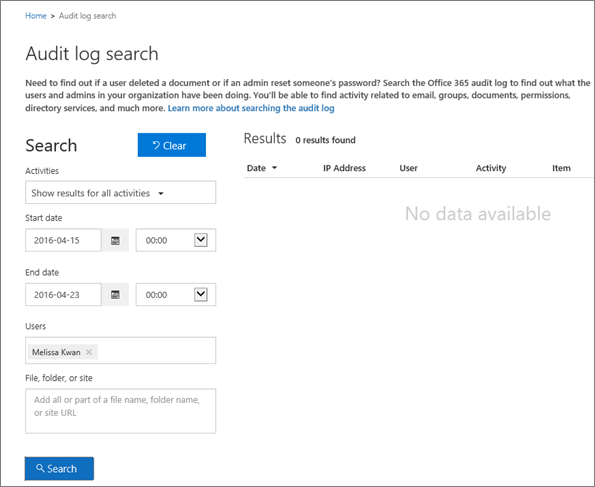 To monitor the status of your extranet account invitations, including changes to the domain allow or deny list; who sent a sharing invitation, requested it, and if it was accepted, revoked or expired, see Search the audit log in the Office 365 Security & Compliance Center. Remove permissions - Remove permissions from the partner users accounts that allowed access to the site(s). This can be done by either removing the security group of which they were a member, or by removing their user identity from the Site Settings > Site Permissions > Members page. Delete partner user accounts - Delete the partner users from Office 365 provided they no longer need access to any other resources in your organization. See Delete a user from your organization. Archive - Archive the site that you created for your partner in SharePoint Online.